The five-man national selection committee led by MSK Prasad in a press conference in Mumbai has announced the 15 man squad for the World Cup 2019. As announced by the selection team Virat Kohli and Rohit Sharama will continue as Captain and Vice Captains of the team. Interestingly, they chose Dinesh Karthik over Rishab Pant for back-up keeper option. Overall, four all rounders are included in the squad- Vijay Shankar, Hardik Pandya, Ravindra Jadeja and Kedar Jadhav. KL Rahul who’s performing well in ongoing IPL season has also got place. Ambati Rayudu who failed to sparkle in recent past is not included in the list. 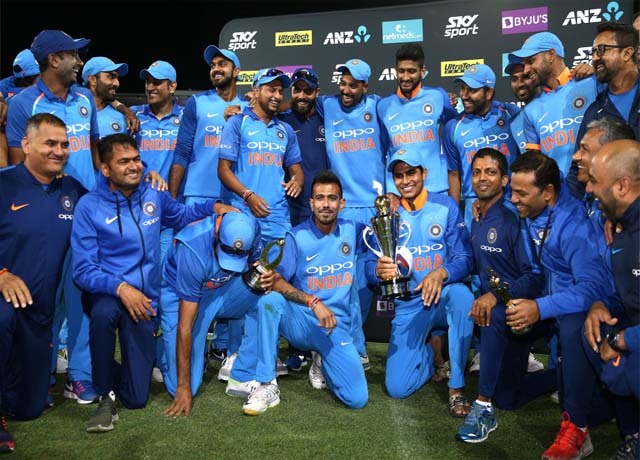 Here is India's 15-man squad: Virat Kohli (C), Rohit Sharma (VC), MS Dhoni (WK), Shikhar Dhawan, KL Rahul, Kedar Jadhav, Kuldeep Yadav, Hardik Pandya, Vijay Shankar, Dinesh Karthik, Bhuvaneshwar Kumar, Ravindra Jadeja, Y Chahal, Jasprit Bumrah, and Md Shami.